Hando Ju Jitsu are proud to be sponsored by Hatch Construction Ltd.
Based in Sawbridgeworth Hatch Constuction are specialists in House Refurbishment, Kitchen Extensions, Loft & Basement Conversions throughout London and the Home Counties. By phone, mail or email. Hando Mini-Warrior Classes - NOTE: Mini-Warrior Numbers are Limited so please call before bringing your child along. Hando Ju Jitsu. All rights reserved. Come along to a training session and check out our club at no cost. Hando Mini Warriors - 5 to 7 years - NOTE: Mini-Warrior Numbers are Limited so please call before bringing your child along. 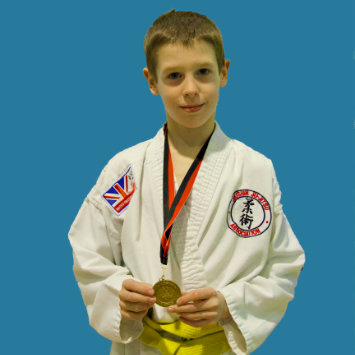 This specialist Club for those who wish to compete in the Jikishin / UKMAGB Annual National Championships. 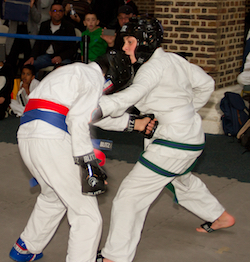 The Junior Competition Club for those who wish to compete in Kata, Groundfighting, Sparring and Random Attacks, starts at 6.00pm at Mark Hall on Mondays September and through to October - prior to the UKMAGB/Jikishin Ju Jitsu Association National Championships. Last Tuesday of the Month 9:00pm - 10:00pm - Ko Budo (Weapons) Free if Eligible - By Invitation ONLY. Hando Ju Jitsu Clubs will be closed as follows over the Festive Season. We wish you all a happy holiday season, a Merry Christmas and a Happy New Year. 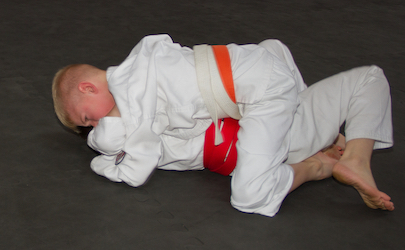 Hando Jikishin Ju Jitsu Clubs welcome beginners of all ages. Ju Jitsu is fun, practical,and will have a number of benefits including getting fitter, improved reflexes, improved self confidence and, of course, self defence. Located at Harlow, Essex and Ongar, Essex the clubs appeal to a wide range of people, male and female, from 5 to 75 years old. Concessions are available to the unemployed and pensioners. Training can be paid for weekly, monthly or at the start of each lesson. For beginners the process for starting Ju Jitsu is simple: Firstly, you need to turn up at a training session (pretty obvious that one), complete a Jikishin Ju Jitsu Association Membership Form, the only clothing required is a pair of jogging bottoms and a T-shirt, we'll then take you through Mat Etiquette (the rules of the Dojo or Training Place), Breakfalls (how to fall safely when being thrown) and then on to the first techniques in the White Belt Syllabus. There will be some striking & kicking instruction and practice, and you may well learn some street self defence techniques, or skills fighting on the ground (the majority of street fights end up on the ground). These are taught in a manner that is friendly to the novice, but that can still be enjoyed, employed and practiced by the higher grades. In Hando Ju Jitsu we all practice together, whatever the grade. Personal hygiene is positively encouraged, and out of respect to training partners, students should arrive at club clean, ensure that fingernails and toenails are short, and that training clothing is clean and fresh. You will learn some Japanese Terminology like Sensei (Teacher), Rei (bow) and Yamae (stop immediately) - but not too much, we use mostly English. You will learn some Kata, some Traditional Japanese Weapons and some things not generally taught in traditional Ju Jitsu classes, for instance we discuss the Law as it relates to Self Defence, stances and body language, conflict resolution, and much, much more. For more information, please visit our Frequently Asked Questions section. The Clubs are run by Earl Walker, 5th Dan, and Jackie Walker, 4th Dan. The club is also fortunate enough to have a number of very experienced and talented instructors who both train and teach regularly, see our Coaches Page. Our Instructors are willing and able to pass on their vast experience to newcomers and experienced students alike. Under the United Kingdom Martial Arts Governing Body (UKMAGB) the club has a full Child Protection Policy & Code of Conduct. All instructors are trained, hold First Aid certification, and hold Public and Personal Liability Insurance, and enhanced Criminal Records Bureau Clearance - whether Junior or Senior, the safety of our students is always the first priority. NOTE: Mini-Warrior Numbers are Limited so please call before bringing your child along. FREE if Eligible - By Invitation ONLY. PLEASE PAY AT THE START OF THE LESSON. Licences, including the student to student insurance cover MUST be purchased on 3rd week of training, failure to do so will invalidate any insurance cover and will invalidate any claim made – note that it is YOUR responsibility to ensure that you have insurance cover on or after the third week of training. For Gradings all candidates must wear an official Jikishin Ju Jitsu Association Gi. We are happy to respond to your questions. Please send an email - We will respond shortly. Not during Class Times, please. Hando Jikishin Junior Ju Jitsu Clubs have been running since 1979 and have built a solid reputation for the quality of training and the discipline of the students. Located in Essex at Harlow and Ongar, the clubs appeal to a wide range of young people from 5 to 16 years old. The club is open throughout the school holidays. The Junior Competition Club for those who wish to compete in Kata, Groundfighting, Sparring and Random Attacks, starts at 5:15 pm for 1 hour at Mark Hall on Monday 5th September 2016, and will run through to Monday 30th October 2017. Note that there is no Competition Club session on 12th September. combines the Mini-Warriors & Warriors classes. The clubs are run on the basis that all children training must act sensibly and be and very self disciplined, this has a carry over into everyday life. Our students of Ju Jitsu are generally more self confident, and have a better attitude to life, than those children who do not train, we impress upon the children that Ju Jitsu training is a privilege, and that they must show respect to their instructors, other children training, and to anyone who visits the Dojo (training place), including parents. The Hando Mini Warriors and Warriors are expected to behave to a high standard, and are rewarded for their good behaviour with games at the end of each training session - poor behaviour, and especially any signs of bullying, results in the young person not being allowed to play the game, and can even result in a suspension from attending the club. We simply do not put up with unruly or bad behaviour. At the end of class, all the children are expected to thank the Coaches, and this engenders politeness and respect. Overall, this results in a great training experience for all. Initially the only clothing required is a pair of jogging bottoms or a leotard, and a T-shirt. For those young people who wish to compete, Hando Ju Jitsu Clubs have regular training sessions covering Sparring, Groundfighting, Open Hand & Weapons Kata. Juniors are encouraged to train for competition, even if they do not intend to compete, as this is an excellent way for students to try out the techniques they have learned in a dynamic situation. There are specific sessions for Groundfighting and Sparring. 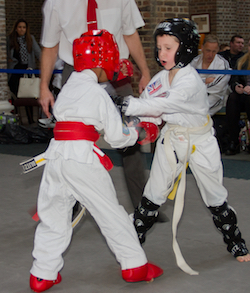 Under the United Kingdom Martial Arts Governing Body (UKMAGB) the club has a full Child Protection Policy. All instructors are trained, hold First Aid certification, and hold Public and Personal Liability Insurance, and enhanced Criminal Records Bureau Clearance (DBS - Disclosure & Barring Service) the safety of our students is always the first priority. 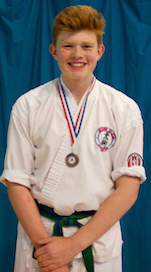 Jackie Walker 4th Dan is the Club Welfare & Child Protection Officer. 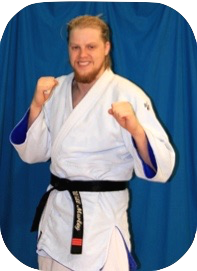 Earl Walker, 5th Dan and Senior Club Coach, is the Chief Instructor for Hando Ju Jitsu Clubs. The Junior Competition Club for those who wish to compete in Kata, Groundfighting, Sparring and Random Attacks, starts at 5:15 pm for 1 hour at Mark Hall on Monday 5th September 2016 and will run through to Monday 30th October 2017. Just off the A414 Four Wantz Roundabout (opposite Smiths Restaurant). The Juniors Club has specific training for those who wish to compete. The first training session of each month (Monday, Tuesday & Friday) is Groundfighting practice & competition, and the last session of each month (Monday, Tuesday & Friday) is Sparring, Kata & Random Attacks practice. Those who are not interested in competing will train the Jikishin Junior Syllabus. 1. We will ensure that all instructors are properly vetted; this procedure may involve a Local Authority and/or Police Check. 2. We may ask for the names of two referees who are prepared to provide written references for the instructor. The United Kingdom Martial Arts Governing Body’s Chairman or A Senior Instructor may contact the referees personally. 3. 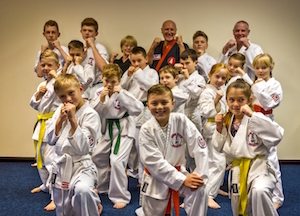 All instructors must agree to adhere to the guidelines laid down in The United Kingdom Martial Arts Governing Body's "Child Protection Policy" document. The United Kingdom Martial Arts Governing Body believes that every child, regardless of age, has at all times and in all situations a right to feel safe and protected from any situation or practice that results in a child being physically or psychologically damaged. If we have suspicions about a child's physical, sexual or emotional well-being, we will take action. As a martial arts Instructor you can reduce situations for abuse of children by adhering to good practice. As a martial arts Instructor you are also in a position where you may recognise signs of a child being abused outside of your classes. It is your responsibility to act if you have concerns with regards to the well being of a child. Instructors in other countries should make a note of their local child welfare office or help line. Hando Jikishin Ju Jitsu Clubs has a Code of Conduct for all those who coach, train or bring children or others along to train. The Code of Conduct is fair and reasonable and sets out what all participants can expect and what is expected from them. At Hando Ju Jitsu Clubs we are fully committed to safeguarding & promoting the wellbeing of all our members. The club believes it is important that everyone associated with the club should show respect & understanding for the safety & welfare of others. Therefore, members are encouraged to be open at all times & share any concerns or complaints that they may have about any aspect of the club with Sensei Earl or Jackie Walker. Attend appropriate Coaching opportunities to ensure good practise. The Club Welfare Officer is Sensei Jackie Walker 4th Dan. The above Code of Conduct is mandatory for all members of Hando Jikishin Ju Jitsu Clubs. 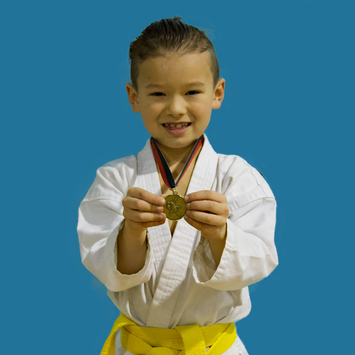 The Mini Warriors class is designed for children from 4 years to 7 years old, for boys and girls, and has quite a different approach to the Hando Warriors class. 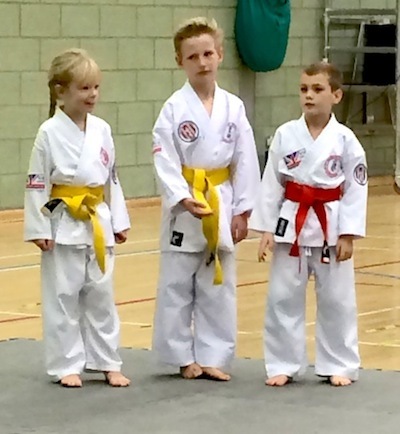 An excellent starter class for younger children and those who are a little shy or intimidated by larger classes, the Mini Warriors class will introduce Ju Jitsu in a smaller class with a high degree of attention to individuals. The class is a little shorter than the Hando Warriors class reflecting the shorter attention span of the younger children. With younger children concentration levels are often an issue. 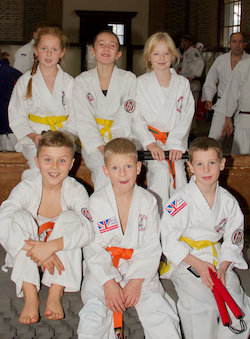 The Mini Warriors class is designed to bring the smaller kids into Ju Jitsu through a route that includes more Ju Jitsu type games, bringing out a competitive spirit in a very controlled environment, and instilling discipline. This prepares the youngsters for the Hando Warriors class. Rewards for improving skills, working on the Jikishin White and Yellow Belt syllabus, learning to breakfall, and learning their first Kata, are given, as well as rewards for good behaviour. The youngsters are given the incentive to work hard and achieve their goals. 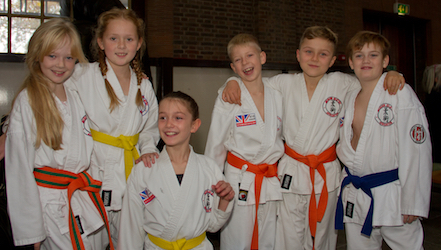 Whatever the age, the children are encouraged to work hard, and on reaching the age of 7, or achieving Orange Belt, the child will move up into the Hando Warrior class. 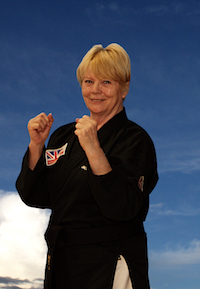 The Club is run by Jackie Walker, 4th Dan and Senior Club Coach. Jackie Walker is also the Club Welfare & Child Protection Officer. 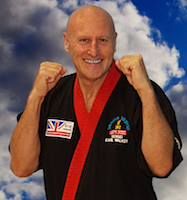 Earl Walker, 5th Dan and Senior Coach, is the Chief Instructor for Hando Ju Jitsu Clubs. Monday 6:00pm to 7:0pm This specialist Club for those who wish to compete in the Jikishin / UKMAGB Annual National Championships. The Warriors class is for older children, either those who have come through the Mini Warriors system, or just beginning Ju Jitsu. From 6 years to 16 years old, the Hando Warriors concentrate on the Jikishin Syllabus, learning the same techniques (with a few exceptions) as the adults, and prepare them for achieving the ultimate goal of a Black Belt. The skills are practical and transferable, and gives the children self confidence, self control and an understanding of the discipline required to achieve success. The Warriors are encouraged to work hard, and to achieve their goals in accordance with their abilities, and the children are never rushed into gaining their next belt. It is through encouragement, good teaching methods, hard work and dedication that the members progress, and often go on to train at the adults classes. The Warriors class has a reward system, and the children are encouraged to behave well, in order to have a game at the end of the class - the loss of participation in the games at the end of class is ALWAYS explained in terms of reward, and never as a punishment. We believe in inspiring good behaviour through reward, and the discipline at the club is very high. 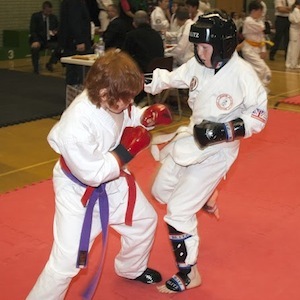 For those who wish to compete, there are opportunities to train in Kata, Random Attacks, Groundfighting and Sparring (sparring kit is compulsory) - for further details on the competition categories see our Competition & Medals section. There are also specific training sessions for those who wish to compete held on Mondays from July to November to ready the competitors for the Jikishin Ju Jitsu Association / UKMAGB National Course and Competition which is held annually, usually in November. See Hando Ju Jitsu News for more on competition. Jackie Walker is the Club Welfare & Child Protection Officer. Monday 5:00pm to 6:00pm This specialist Club for those who wish to compete in the Jikishin / UKMAGB Annual National Championships. For those young people who wish to compete, Hando Ju Jitsu Clubs have regular training sessions covering Sparring, Groundfighting, Open Hand & Weapons Kata. 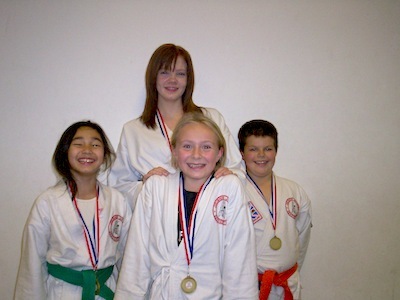 Juniors are encouraged to train for competition, even if they do not intend to compete, as this is an excellent way for students to try out the techniques they have learned in a dynamic situation. The Competition Club runs at Mark Hall, Harlow on Mondays from 6:00pm to 7:00pm from the end of September to the end of October. 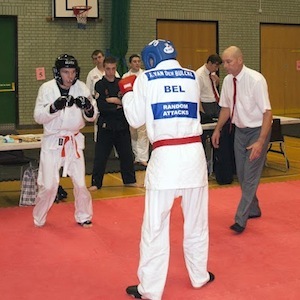 The Jikishin/UKMAGB National Championships are held in November each year. See the Jikishin Website Events page for details. There are specific sessions, covering competition rules, correct technique for each category, scoring, Judging criteria (what the Judges will look for), Referees (How the referees will manage each bout; presentation and lots of practice. 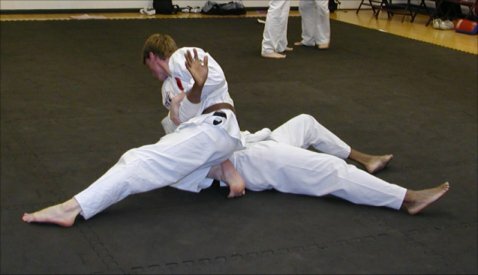 Groundfighting: Techniques from Start Position; Moving to dominant positions; Hold Downs; Defences from back; Practice bouts under competition conditions. Sparring: Punches; Kicks; Throws; Defence against kicks and punches; Footwork; Defending against throws; Practice bouts under competition conditions. Kata: Open Hand Kata; Weapons Kata; Pairs Kata; Kata Demonstration; Correct technique, Kata application; Speed of execution; Perfecting the Kata for competition; Practice under competition conditions. 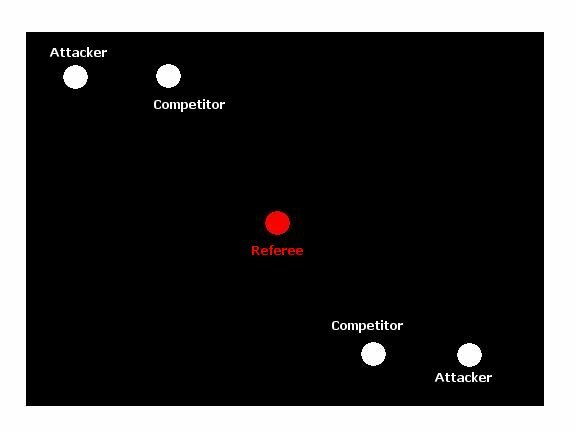 Random Attacks: Attacks for each Grade; Defences; Correct positioning and application; How to perform in competition; How Random Attacks are scored; Practice under competition conditions. See our Competition & Medal Winners for explanation on the categories of competition. 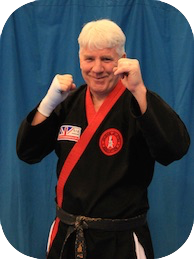 Sparring and Groundfighting at the Hando Competition Club is run by Sensei Earl Walker, 5th Dan, Senior Coach, Chief Instructor for Hando Ju Jitsu Clubs, and Jikishin/UKMAGB National Fighting Systems Instructor. 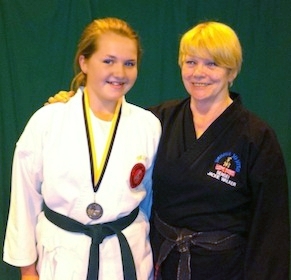 Kata and Random Attacks at the Hando Competition Club is run by Sensei Jackie Walker, 4th Dan and Senior Club Coach. Hando Jikishin Senior Ju Jitsu Clubs have been running since 1979 and have built a solid reputation for the quality of training and the discipline of the students. The Senior Classes are very flexible, with Self Defence, Competitive Sparring & Groundfighting, Random Attacks and Kata practiced regularly, in addition to the usual Syllabus work required to attain each grading. We are open to male and female students, and young people (usually over 14), who are encouraged to join the senior class in order to make improvements in their technique. 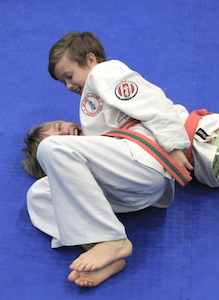 In order to progress a student must show regular attendance, train diligently, obey the Club and Association rules, and perform the techniques taught in a safe and controlled manner. We have a great mix of men & women, of all ability. The club is eclectic, and in addition to the usual Ju Jitsu techniques, we also utilise techniques from from boxing, wrestling, karate, MMA & Muay Thai - this give all students something to work with. Located at Harlow in Essex the clubs appeal to a wide range of young people from 14 to 70 years old. 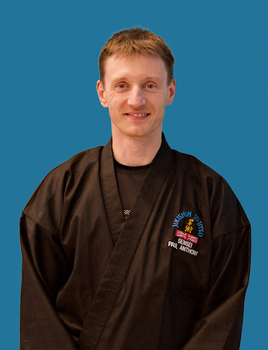 The Club is run by Earl Walker, 5th Dan and Level 4 Coach. Based in Essex, Earl Walker is an ex Amateur Boxer, Amateur Freestyle Wrestler, and Doorman. He has huge experience in dealing with confrontation, aggression and violence. Earl also runs a Personal Safety Training company specialising in Lone Working. With more than 40 years experience in the fighting disciplines and over 20 years in Ju Jitsu, Earl is uniquely placed to teach aspects of Self Defence and Personal Safety which are often unavailable to members of the general public. 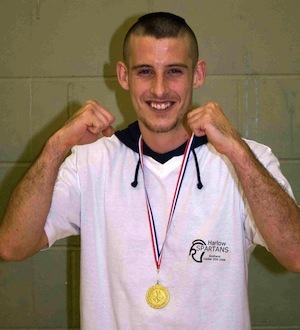 Earl is also a qualified BTEC Level 3 Self Defence Instructor. Earl Walker, 5th Dan and Level 4 Senior Coach, is the Hando Ju Jitsu Clubs Chief Instructor. 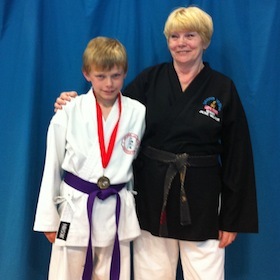 Earl is assisted by Jackie Walker, 4th Dan and other high grade, qualified coaches. See our Coaches Page for further details of our coaching team. Hando Ju Jitsu Club runs a Ko Budo Class on the last Tuesday of each month, in Harlow,Essex, giving the senior students an opportunity to work with all of the weapons in the Jikishin Syllabus. The Ko Budo class is held from 9pm to 10 pm (immediately after the usual class), and is open to all students. Within Jikishin, it is compulsory for students to study the traditional weapons of Japan and Okinawa, as part of the Black Belt Syllabus. Weapons Club is free for those eligible (from Green Belt) and is by invitation ONLY. Many of the traditional Japanese weapons, and the techniques for utilising them, were developed from farming implements. In feudal Japan, the common people were not allowed, by law, to carry weapons. This right was the preserve of the upper classes and the class of warriors known as Samurai. Those who were forbidden to carry weapons developed ways and means to use everyday farming tools as weapons of defence, and the Nun Chaku (Rice Flail) and Kamma (Hand Scythes) are examples of this tradition. 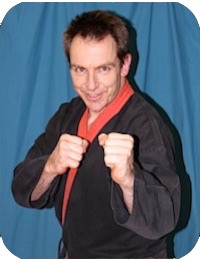 Earl Walker is a Level 2 Ko Budo (Weapons) Instructor. 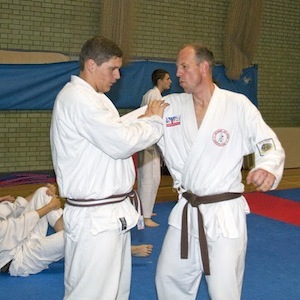 Earl Walker, 5th Dan and Level 4 Senior Coach, is the Hando Ju Jitsu Clubs Chief Instructor. 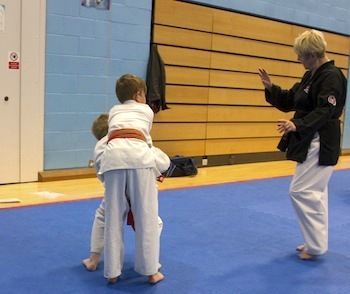 Earl is assisted by Jackie Walker, 4th Dan and other high grade qualified coaches. See our Coaches Page for further details of our coaching team. 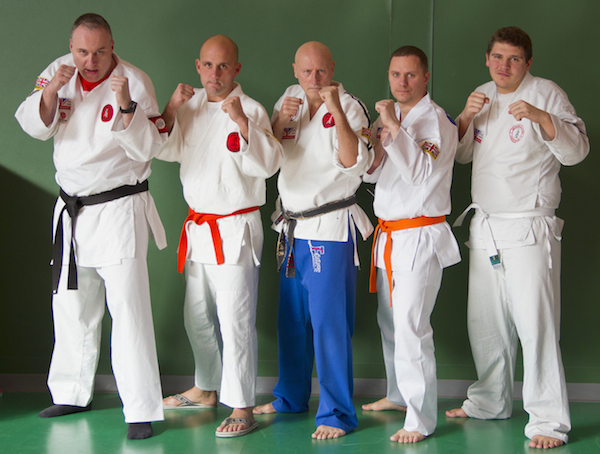 Hando Ju Jitsu Clubs have a number of Coaches who run and assist with the running of the Club, teach, help students train for competition and are always available for advice and assistance. All the coaches you will be introduced to on this page meet the requirements of the UKMAGB Coaching Scheme, have Public Indemnity Insurance, hold a current First Aid qualification, have a UKMAGB Coaching Qualification, and have undergone Enhanced Disclosure and Barring Service (DBS - formerly CRB) checks. All coaches comply with the UKMAGB, JJJA & Hando Ju Jitsu Clubs Child Protection Policy & Code of Conduct. I began my Ju Jitsu journey in April 1991 at the Jikishin Ju Jitsu Club in Harlow, Essex. I started the same night as Wayne Bowen, with whom I trained and took all Gradings from White to Black. I came from a background in amateur boxing, amateur wrestling, and working as a doorman in pubs and clubs. I took on the Ongar, Essex Club as Instructor in 1993, and the Harlow, Essex Club in 1995, after the retirement of my Sensei Steve Fryer. I qualified as a Senior Instructor in 1995. I am proud of the standard of student that we produce at the Hando clubs, and the open attitude to training at the clubs gives both instructors and students plenty of things to think about - as well as Ju Jitsu, we cross train in aspects of boxing, wrestling, judo, karate, ground-fighting, sparring and MMA (Mixed Martial Arts). Every student comes to our Ju Jitsu class with expectations, I am a great believer in giving each and every student the tools for the job. 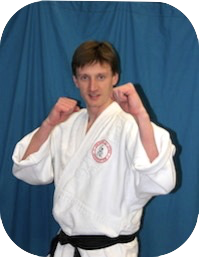 I currently fulfil the roles as the Jikishin JJJA and UKMAGB National Fighting System Coach, the Jikishin Ju Jitsu Association & UKMAGB National Health & Safety Officer,the Hando Ju Jitsu Clubs Health & Safety Officer, the Webmaster for www.jikishin.com. I run a Personal Safety Training company specialising in Lone Worker and Breakaway Training: www.personal-safety-training.com. My training started in 1992 and I have reached the Grade of 4th Dan. I enjoy working with people and seeing the self confidence that students inevitably gain. It gives me great pleasure to work with the children and I enjoy my own training (when I get the time). I feel that it is important for women to be able to defend themselves and am very happy to pass on the skill that I have worked hard to attain – after all, my Sensei did the same for me. I have worked with a number of Ju Jitsu partners over the years but have not concentrated on getting higher grades, just on improving my own work and that of my students. I enjoy the weapons side of the training and like to teach this aspect as I feel that it enhances the combat skills, particularly in terms of stances and body positions. 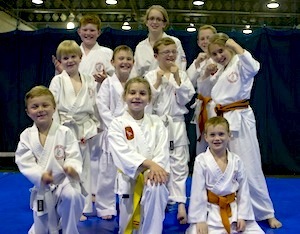 Teaching the Junior class gives a lot of pleasure especially when the children do well at competition or on a Grading. I look forward to many more years in Ju Jitsu. I am the Club Welfare & Child Protection Officer. I started training in 1990 as a productive way to keep fit, and got hooked. I gained my first Dan in 1997, shortly after which I also started training in Shotokan karate (currently Brown Belt). I view martial arts as an excellent outlet in our hectic lives, and it might just keep you safe too. In a confrontational situation, knowing that you are trained to cope better with any eventuality, gives you more time to explore a constructive result. As my Grandfather would say "Use what you have between your ears before resorting to what's on the end of your arms!" I started my Ju Jitsu career in 1991 at the now defunct Harlow Post Office Jikishin Ju Jitsu Club, and when this closed, I moved to Hando Ju Jitsu Club. I have trained wit Steve Thomas since that time and we have achieved 4th Dan together. I really enjoy teaching the juniors, and I work hard with the seniors to help them reach their potential. My attitude to Ju Jitsu is that it is an excellent art with which to learn to defend yourself, it keeps you fit, it requires both physical and mental discipline and is great fun. I started Ju Jitsu when I was 6 years old in 1990. 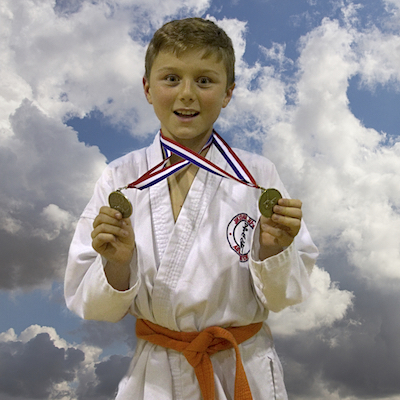 I have competed in Local, National, International competitions where I have won gold in several categories. I ran the children's club at Harlow, Essex, under Sensei Earl, and loved it - passing along the knowledge that I have gained after training for most of my life. I hope to go on to run senior clubs of my own. I enjoy the competitive side particularly, and I have competed successfully in cage fighting (unbeaten), and I currently run MMA classes in Harlow, Essex. I enjoy bringing the juniors along and get a lot of pride and satisfaction from this side of Ju Jitsu. I also assist with the adults training, and keep up my own training regime. My philosophy is if you have to defend yourself, get in early and get in hard. 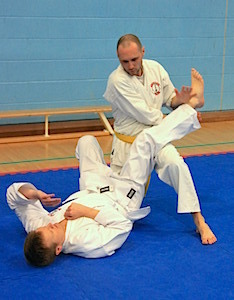 Ju-Jitsu attracted me with its practical approach of ‘use what works to maximum effect’. It quickly teaches the do’s and don’ts of self-defence. I also respected its constant evolution by taking and refining techniques and styles from all fields of combat to build someone who meets the needs of today’s world either in the street or in competition arenas. Since starting training in 1999 I have found our clubs friendly and welcoming to all, combined with strong work ethic that promotes fitness and provides a challenge. Everybody, no matter what their background or fitness, will get something out of the lessons: I always do. I started training in 1997 as I wanted to improve my fitness, I had done a bit of Judo as a child so decided to return to martial arts and haven’t looked back since. I passed my 1st Dan in 2000, 2nd in 2003, level 3 coach 2005 and have competed in competitions where I won a bronze medal for random attacks (Black Belt) in 2003. I enjoy helping and supporting the juniors and being small I can Uke for the older juniors when they don’t have a training partner or are struggling with a technique. I believe that it is good for children to learn martial arts as it will not only help them should they need to use it, but also gives them confidence whilst instilling respect not only for the sensei but also their peers. Are qualified and approved to run a club under the JJJA & UKMA(GB) rules. Come Along and give Ju Jitsu a try. The FIRST LESSON IS FREE to new starters - pop along to any training session to check out our clubs. MEMBERS: Bring along a friend and BOTH OF YOU get a FREE LESSON. Brilliant Showing at Dan Grading. After putting in a huge amount of effort into his training for the last 2 years, Sensei Paul Anthony was successful in attaining his 3rd Dan with Credit on 9th December 2018. Paul is the first of our students to accomplish all of his Dan Gradings with a Credit, and this is testimony to his hard work and effort. 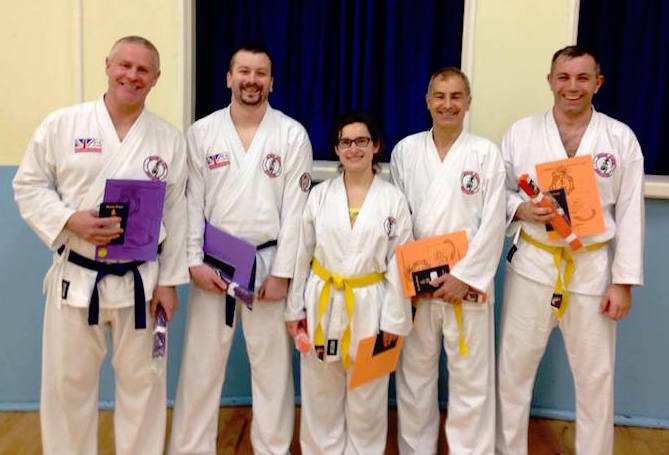 Paul wishes to acknowledge the help and assistance given by Senseis Steve Thomas; Jamie Taylor; Sarah Manarin and Matt Kendrick during the period leading up to his successful Grading. Our Heartiest congratulations to Paul who constantly demonstrates his commitment and dedication to Ju Jitsu and our club. The Hando Team won 9 Medals with a team of 10 competitors on 17th November 2018. Hando Ju Jitsu Club members gave an excellent showing at the Jikishin Ju Jitsu Association 2018 Fighting Championships. A fantastic result and our heartiest congratulations to all competitiors who have been working very hard to get to the competition. Well Done! 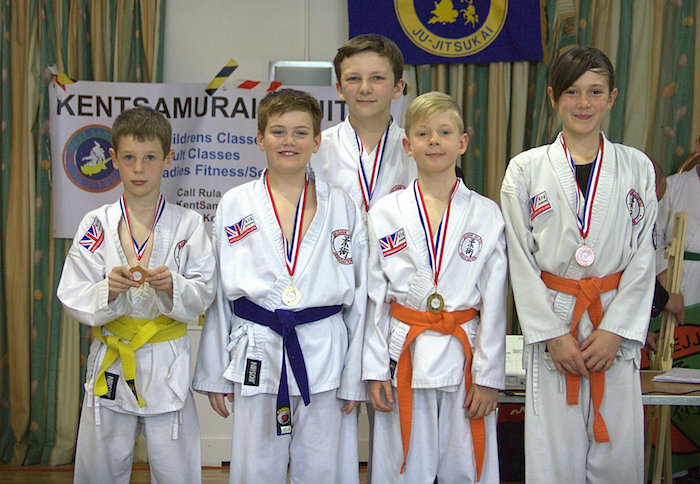 Another great showing at the 2018 Jikishin Kent Championships, held at Snodland. With only 3 competitors this year, our representatives did a fantastic job of winning 4 medals, 3 Bronze & 1 Gold. Luke was knocked out of the Groundfighting by the eventual Gold Medal winner, Tru fought all boys on her way to Gold, and Rhodri performed very well in the Groundfighting, but was outweighed by his opponents. A great day for Jikishin & a Great day for Hando Ju Jitsu Club. 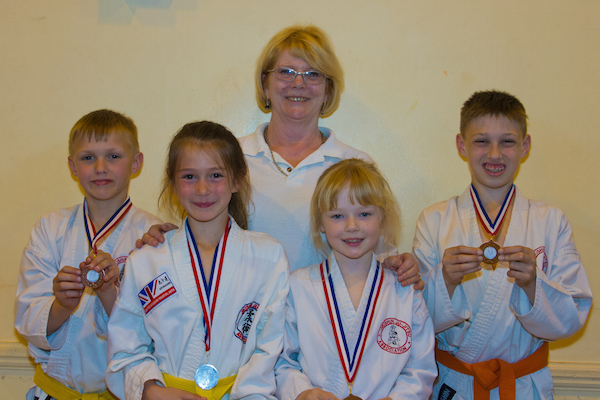 Congratulations to our medal winners and we are looking forward to the next competition. Once again our club had a fantastic showing at the Nationals on the 4th November 2017. The 6 competitors won a total of 10 medals - an absolutely brilliant show from our competition team. A superlative result once again from Hando JJJC's highly dedicated team of competitors. 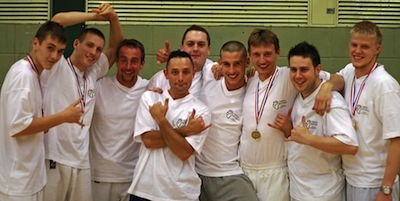 Once again the Hando Competition Team were successful at the JJJA Kent Championships winning a total of 7 Groundfighting Medals. A fantastic showing from a very dedicated team. The Hando Team did a fantastic job, on 5th November at Tilbury Cruise Terminal, the explosive team of 10 won 11 sparkling medals including 3 Gold and 3 Silver. With over 450 competitors, and a contingent from our colleagues in Belgium, the medals were difficult to achieve and hard fought over. The team who have been training hard over the whole year in Groundfighting, Sparring and Kata rocketed to a successful championships and brought home the medal tally for themselves and the Hando Ju Jitsu Clubs. Congratulations to the whole team comprising of: Matt Appleby, Joe Buckley, Tru Ensinger, Ruby Freeman, Jada Guest, Luke Godfrey, Will Jack, Alfie Jenkins, Ben Mays, and RM. Mighty congratulations to the whole team for their hard work, dedication and commitment. Hando Junior Members achieved a great showing in the Jikishin Ju Jitsu Annual Kent Competition winning a total of 7 medals. The team was full of enthusiasm, and worked hard on achieving the highest standard for the competition which was very hard fought by all of those who took part from all over the UK. In the groundfighting, three of the Hando competitors won medals in the same category, gaining Gold, Silver and Bronze - so special congratulations to Lewis Mays, Ben Mays and Archie Goodger. Despite their hard work and dedication 4 team members did not achieve medals so our commiserations to Joe Buckley, Rhodri Morgan, Oliver Oakhill and Luke Godfrey. 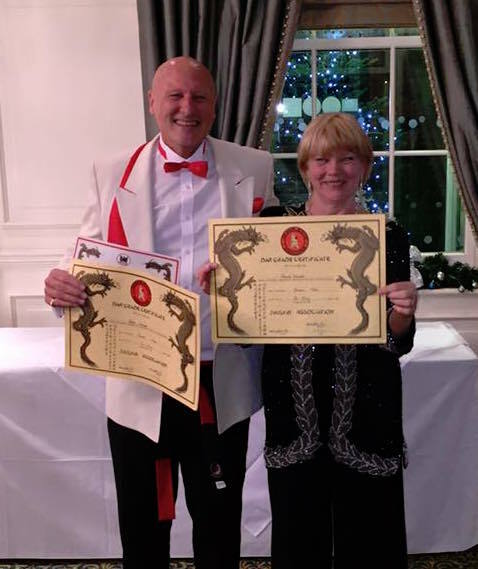 Both received the honour at the UKMAGB/Jikishin Ju Jitsu Association Dan Grade Celebration & Christmas Ball held at Orsett Hall Hotel, Essex on 6th December 2015. Jackie & Earl would like to thank Sensei Steve Thomas & Sensei Jamie Taylor without whose help and support, the grades would have been very difficult to achieve. Know someone who is interested in Ju Jitsu? 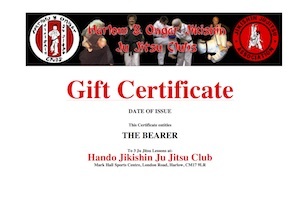 Why not buy them a Gift Certificate allowing 3 lessons at Hando Ju Jitsu Clubs for just £16.00 for an adult, £12.00 for a teenager or £8.00 for a Junior. Congratulations to (L to R) - Jason Plume & Matt Kendrick - Purple Belt. Alla Kurhanska, Tony Rattray & Lee Fearon - Orange Belt. Stephen Heath & Robert Heath - Yellow Belt (in Dojo). Wow! What a result. Our brave and dedicated competition team did a fantastic job at the National Championships this year. Absolutely stunning result with medals won in most categories. All of the Hando entrants to the competition did brilliantly, fighting and performing to the best of their ability, and supporting their fellow club members. A huge thank you to the parents who worked hard to bring the kids along to competition training sessions, and of course to all of the performers who gave their all in both training and competing. 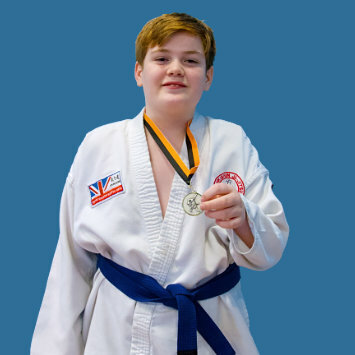 A special mention to Jason Plume who won his first medal in Random Attacks - Jason returned to Ju Jitsu last year, after a 10 years hiatus - a great achievement. Kaitlyn Bell and Rhodri Morgan - two of our youngest competitors deserve a special mention for the hard work they put into their training, which paid off with Gold for both. Congratulations to all who took part - we are so very proud of your achievements. 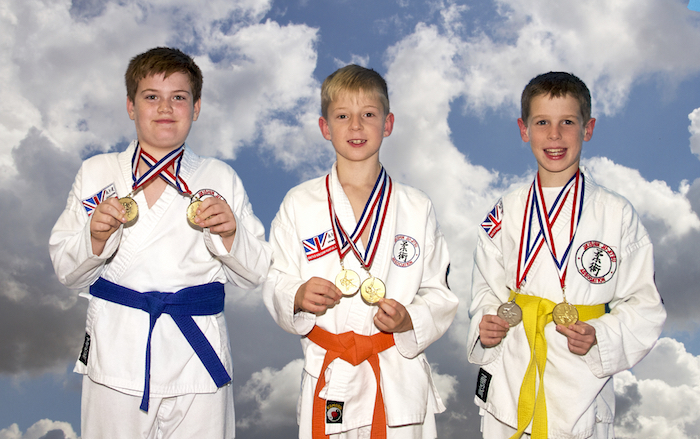 A team of 4 Juniors entered the National Kata & Random Attacks competitions held at Ditton, Kent on 25th April 2015. Our heartiest congratulations to the competitors who performed brilliantly on the day. The 2014 Jikishin Ju Jitsu Association National Championships took place on 1st November 2014 at Mark Hall Sports Centre, Harlow, Essex. With Groundfighting, Sparring and Random Attacks. 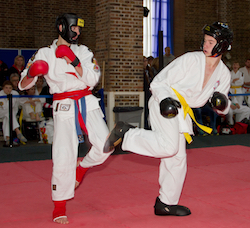 The National Championships attracted over 300 entries in the fighting disciplines. 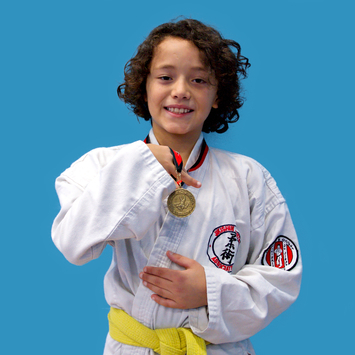 Hando Ju Jitsu Club won 6 medals in the championship: 3 Gold, 1 Silver, and 2 Bronze. 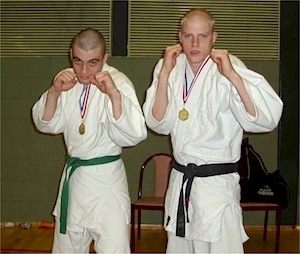 In the Junior Ground Fighting, brothers Lewis and Ben Mays won Gold and Bronze – having competed in the same weight categories they fought each other in the finals, both gaining success. Congratulations to all who competed in this challenging National Tournament. 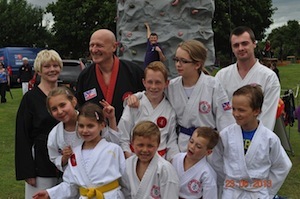 Hando Jikishin Ju Jitsu Clubs attended the Ongar Carnival on 22nd June 2014 - at Chipping Ongar Primary School, Greensted Road, Ongar, Essex, CM5 9LA. We will had demonstrations from both juniors & seniors, weapons, competition, throws, locks and holds, groundfighting, sparring & kata. The Carnival was great fun for everyone who attended. Sensei Paul Anthony took his 2nd Dan Grading on 9th December 2013 and passed with a Credit. Most of our students and our Senseis are aware of the hard work and dedication that was shown by Paul in his determination to pass 2nd Dan, Paul also achieved his Level 4 Ko Budo (traditional Japanese weapons) Award. Paul is a hardworking member of the team of Instructors at Hando Harlow, and we heartily congratulate Sensei Paul on his achievement. Based in Essex, Earl Walker (centre) & Jackie Walker travelled to Spain, with a team of competitors including David Mizon of Hando Harlow Club (far right), to compete in the Euro-Budo International European Sport Fighting Championships. Association National Course & Competition 2013. Picture: Tess Godfrey © 2013. 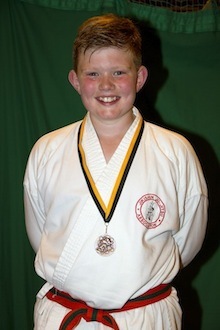 Luke Godfrey - Bronze - Junior Ground-Fighting & Bronze - Junior Sparring. Congratulations to all of the team from Hando Ju Jitsu Clubs who entered the Epping competition, and a special mention for those who medalled. 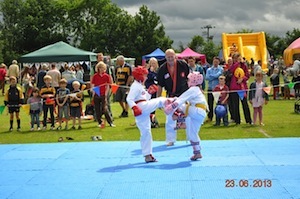 A team of youngsters appeared at the 2013 Ongar Carnival demonstrating their Ju Jitsu skills to the general public, and generally having a fun day. Our thanks to Dave Marriot who gave up his time to help, and to Rebecca Hunter for the photographs. 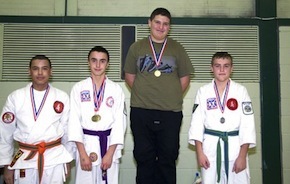 David Mizon won his first senior Sparring Gold Medal with a fine performance in the competition. Unfortunately, in the first round in the finals, he fractured the radius bone in his arm, but battled on in the second round with the broken arm to secure the gold medal spot. Due to the injury, Dave was unable to compete in the senior Heavyweight Groundfighting category, and unable to defend his title. We look forward to Dave competing and gaining both National titles next year, to match his excellent performance as a junior competitor. Maciet Frackowiak was unlucky to lose his bout against the eventual the Gold Medal winner, and fought bravely and consistently well, to be knocked out by a split decision. 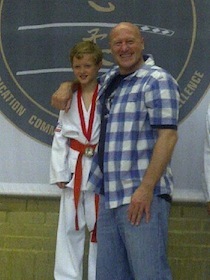 Congratulations on a Bronze Medal and a great debut performance. Juniors Aoife Burn and Mikey Charlton both performed superbly to win Bronze Medals in the sparring category keeping to the tradition of great fighting skills displayed by all Hando competitors. 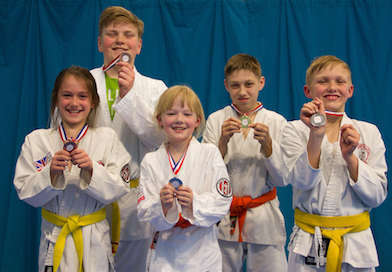 Entering a team of 5 competitors in the OEL Interclub Competition held at Epping Sport Centre the Harlow, Essex & Ongar Team won 2 Gold Medals and 1 Silver Medal. Congratulations to all of the team who competed, and to those who won medals. 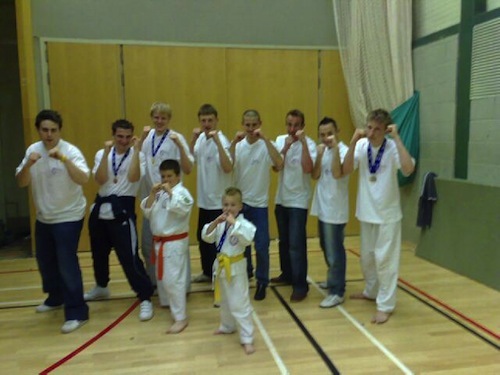 Entering a Team of 6, Hando Jikishin Ju Jitsu Club won 6 Medals at this years Jikishin National Championships. 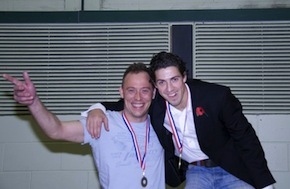 The team of competitors from Harlow & Ongar Hando Ju Jitsu Clubs have once again come up trumps winning a total of 6 medals in the Jikishin Ju Jitsu Association Championships held in Southend on 3rd November 2007. Will Murley, not defending his title this year due to competing in a higher weight class, still came home with the Gold. 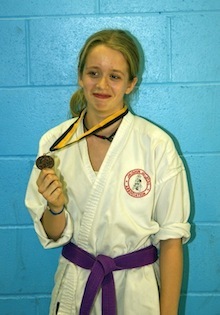 Georgia Jackson also won Gold for her superb performance in the Junior Girls Groundfighting. Dave Read who retained his title in the Mens Groundfighting with a great display of control on the ground - keep tapping them out, Dave. Honours also went to Billy Cleary who did terrifically in obtaining a Bronze medal in the Junior Random Attacks - Pee-Wee class, Fraser Simpson, who gained his first medal this year in the Junior Sparring coming in at the Bronze position after a gutsy performance, and Paul Anthony, who was very unlucky to be eliminated at the Bronze Medal position after a great display of heart and determination in the Mens Sparring. Congratulation to the whole team. The support given to the competitors by the other members of the Team was fantastic and speaks highly of the competitive team spirit built at the clubs. Well done to all of those who competed, a great effort. Competing in the United Nations of Ju Jitsu International Championships in Thessalonika, Greece, Harlow, Essex trio Will Murley, Coren Daly and Lorna Crump competed at top level. Our intrepid trio returned with two medals from the experience. Will Murley won the Gold Medal in his weight class in the Men's Groundfighting, and Lorna picked up a Bronze Medal with a brave display in the Women Groundfighting event. 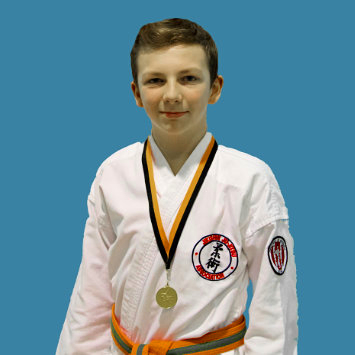 Harlow & Ongar members competed in the Kokoro Kai & Wakarishin (UNJJ) International Championships in Southend and won 3 Gold (Dave Reid, Will Murley - (Groundfighting) and Billy Cleary (Junior Random Attacks). 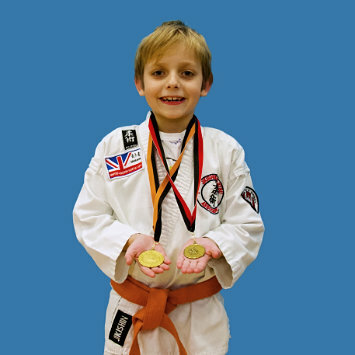 A special mention for Billy who is 6 years old and after a lot of hard work and dedication, performed superbly on the day to win a most deserved Gold. A lesson for all of our juniors. One Silver Medal and Two Bronze Medals completed the tally for the 3 Clubs with Dave Reid picking up his second medal of the day - Silver, and Mike Merralls and Chris Richardson picking up a Bronze Medal each for their efforts. Well done to all7the competitors on the day - let's keep up the good work. Dave Read, Billy Cleary, Kylan Adams. Farah Martin (OEL Ongar) Gold, Sarah Jane Hunt - Silver, Georgia Jackson- Bronze, Kylan Adams - Bronze. Will Murley and Chris Richardson both successfully defended the Gold Medals they won last year in the Groundfighting categories. 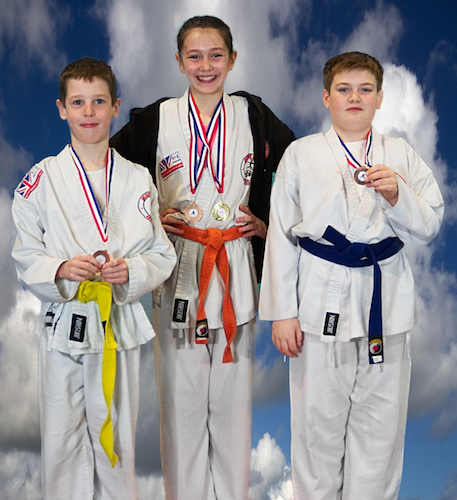 The juniors did exceptionally well in the Jikishin Ju Jitsu National Championships with 3 club members winning medals: Sarah Jayne Hunt won a Silver Medal in the Girls Groundfighting category, Kylan Adams winning a Bronze in the Boys Sparring (at the third time of competing - well done for persevering Kylan) and Georgia Jackson in the Girls Groundfighting. Georgia's training partner, Farah Martin, who trains at OEL Ongar, beat Georgia in the semi finals to go on to get a Gold Medal. 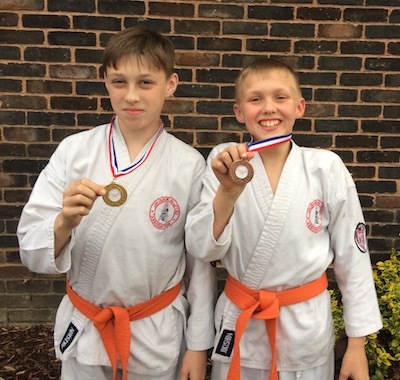 Harlow's Will Murley and Chris Richardson, and Junior Competitor Michael Franklin, from our Ongar Club, won Gold Medals in the combined Jikishin Ju Jitsu and British Ju Jitsu Championships in Southend. Both competitors won all of their bouts by submission, an unusual feat. 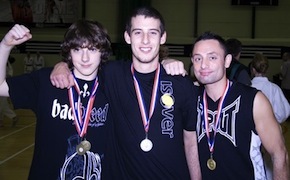 Will (20), Chris (23) and Michael (16) all won Gold medals in their respective weight categories. All of the guys have been training and working on their Groundwork skills for quite some time now, and it is very gratifying to see them reach the pinnacle of success in the UKMAGB Championships. There were over 500 attendees and competitors on the day, and the standard is rising every year, so it is a great achievement on the part of the boys. 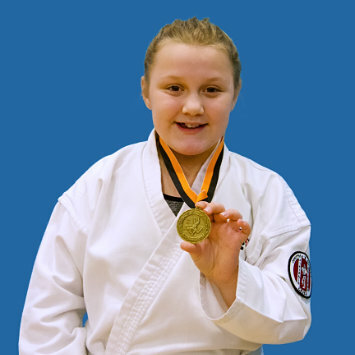 A Silver Medal was gained by Sarah Jayne Hunt (15), who put up a great performance in the Final, to be crowned Runner Up in the Female Junior Sparring category. 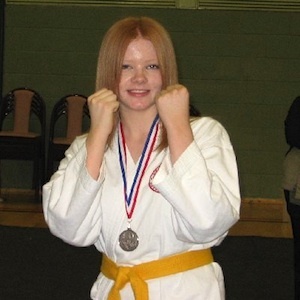 Sarah-Jayne has recently joined the Harlow, Essex club and competed for the first time in the British Championships. Far from being nervous, Sarah went into each of her fights with a great attitude and a will to win. She has a great future and the potential to go further in competition in the years to come. Hando Pair win International Medals in UNJJ International Competition - September 2005. Will Murley and Chris Richardson travelled to Ireland to represent their clubs in the UNJJ Congress & Competition in Letterkenny, Northern Ireland, where the standard was high. 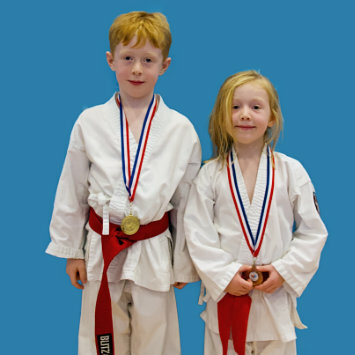 Both returned with medals for their efforts, and we are very proud of their achievements. Both Will & Chris have been working hard on improving their Groundfighting skills for the competition and hope to go on to gain further honours in the British Ju Jitsu Association (GB) National Championships in November - with the dedication to training that they have shown, we are sure that they will attain further success. 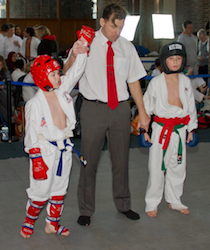 At Hando Ju Jitsu Clubs, it is not compulsory to enter competition. We do, however, encourage those who have a competitive urge, and we train in a number of disciplines in the area of Ju Jitsu. In many Martial Arts there are only one, or at best two types of competition. In Jikishin Ju Jitsu we have six, Groundfighting (Grappling), Sparring (Kicks, Punches and Throws), Random Attacks and three forms of competition Kata: Open Hand, Weapons and Pairs Demonstration. Sensei Earl Walker is the National Coach for Jikishin JJA, UKMAGB and Euro-Budo International Fighting Systems - Groundfighting & Sparring. Hando Ju Jitsu Club is renowned for the quality of it's Groundfighting training and the toughness and resilience of it's Groundfighting competitors. Hando Ju Jitsu Clubs have a great attitude toward Groundfighting. Most fights will end up on the floor - so where better to hone your skills? 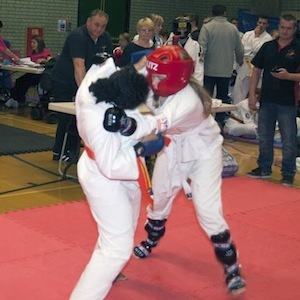 We regularly practice Ground-fighting in the Dojo, both for practice in self defence and for competition, where we have had considerable success in National and International competition - see News Page. Quite a number of our students are practicing groundfighting every week, and enjoy the challenge. We also encourage new students coming to train to try out this very competitive discipline. Our Ground-fighting is Ju Jitsu based, with influences from wrestling, judo, BJJ and cage fighting (MMA). Groundfighting is almost an Art in itself, and we like to practice new techniques and counters, work out fresh moves and generally try as a group to improve our skills. See our Techniques Section for a selection of techniques taught at Harlow. Sensei Earl Walker runs the Annual Groundfighting Seminars on behalf of Jikishin JJJA and is also responsible for training the National Team. 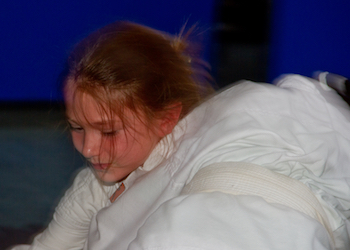 Hando Jikishin Ju Jitsu Clubs has a number of students who practice and enjoy the very competitive art of sparring. At Hando Jikishin Ju Jitsu & Clubs we have a some room for practice, along with much of the kit you might expect, such as focus mitts, Thai Pads, head guards, gloves etc. We regularly have practice sessions, with students pitting their skills against their contemporaries, it is good practice and for competition and the street. 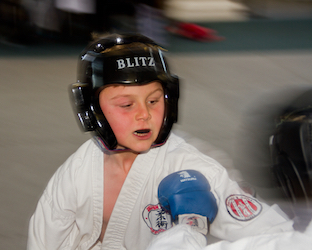 Our sparring incorporates kicking, punching, throws and take downs. Once on the ground, student look at one of our other fighting and competition disciplines - Groundwork. With elements of Boxing, Karate, Kickboxing, Wrestling, Muay Thai, Judo, and of course, Ju Jitsu, we look to train our students to be able to deal with any situation - in the street, or in competition with rules - whatever the competitive. Sensei Earl Walker runs the Annual Sparring Seminars on behalf of Jikishin JJJA and is also responsible for training the National Team. 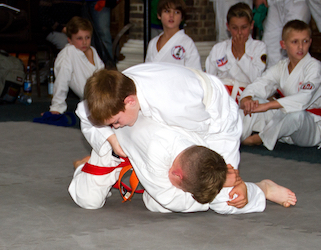 Ongar Hando Ju Jitsu Club has a number of students who practice and enjoy training and competing for Random Attacks. At Ongar Hando Ju Jitsu Club we plenty of mat room for practice. We regularly have practice sessions with students pitting their skills against their contemporaries in simulated competition. it is good practice and for competition and the street. Random Attacks are particularly good for testing your skills out in a competitive, but non- combative environment. Kata are sequences of predetermined fighting actions that help the student understand the body movements required to be able to correctly perform a technique or series of techniques. Kata is not designed to be a fighting system in it's own right, but practice for the real thing. There are many types of Kata, and Kata is very common throughout the Martial Arts. Kata are sometimes referred to as Patterns or Forms. Kata is rather like the training that a boxer does, for instance, to perfect the power and delivery of a punch. By practicing a particular punch, at first slowly, and then faster to full speed and repeating the action over and over, the boxer gets the benefit of muscle memory i.e. the ability to carry out a sequence of movements without conscious thought. In competition Kata is separated into 3 categories: Open (or Empty) Hand Kata, Weapons Kata and Pairs Kata. 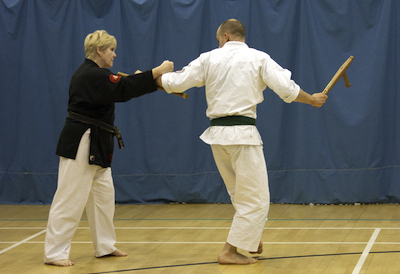 Kata is judged on the accuracy of the Kata and on style (how the Kata is performed). For some, the thought of joining a Martial Arts class is daunting, and may be a difficult decision to make. When looking for a self defence class, the prospect of training with a number of strangers may be disconcerting. If this is the case, then private lessons with a skilled and experienced instructor may be a viable alternative. The Self Defence Training is designed to help you to deal with any violent confrontation - get trained and face the world with confidence. 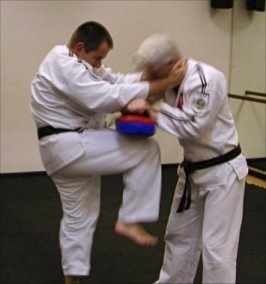 Martial arts techniques can be helpful in self defence situations and the defender must understand the difference between practicing a Martial Art and taking measures to defend one’s person and /or property. 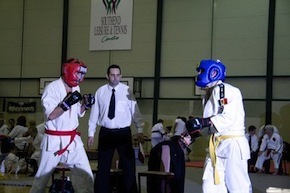 In martial arts competition, there are rules, and the idea is for you to beat your opponent within the rule structure.. In self defence, the only rules are to get the aggressor to cease their attack, in order to give you an opportunity to escape. What Are The Benefits of Ju Jitsu? What About the Legal Side of Self Defence? Based in Essex, Earl Walker, Chief Instructor of Hando Ju Jitsu Clubs is a BTEC Level 3 Self Defence Trainer and is well versed in Self Defence and the Law. The principle of Self Defence and Proportionality are discussed with students, and the requirements of the law made clear. Should you have any questions or issues around Self Defence, please discuss with Sensei Earl. Ju Jitsu is fun, and you will be learning new skills, this is a benefit in itself. If you are unfit, Ju Jitsu will help you to address this, and will help to increase your personal safety and self confidence. One of the main reasons that students commence training in the Martial Arts is to learn how to defend themselves. Many drop out during their career in Martial Arts due to lack of motivation, illness or injury, boredom, or sometimes life simply changes and no longer allows training. However, the for those who persevere, often the motivation becomes one of self improvement. There are many schools and styles of martial arts, and these are generally thought of as having been started in the Orient and brought to the West, however, the Martial Arts include “Western” sports such as boxing and wrestling, Brazilian styles such as Capoeira, Russian (Sambo), French (Savate) and so on. Ju Jitsu is a Japanese Martial Art which includes all aspects including striking and kicking, joint manipulation, throwing, choking and strangling and grappling. Is A Black Belt Automatically A Ju Jitsu Teacher? I have never trained any Martial Arts before, will I be out of my depth? Is a Black Belt Automatically an Instructor / Coach / Teacher? The UKMAGB also have a Child Protection Policy in place which all instructors are obliged to abide by. The minimum time from starting Ju Jitsu to becoming a Black Belt is 3 years. On average to gain a Black Belt takes 4 years plus. This is because the training required to obtain a Dan Grade in the Jikishin system is designed to be challenging, the requirements for First Dan Black Belt can be found on the Jikishin Ju Jitsu Association Dan Grade Syllabus page. 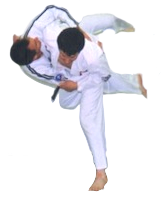 Whilst in many Martial Arts, the throws and strikes are referred to by their Japanese names; we use English to describe all of the techniques within the Syllabus. We feel that our students come to learn to defend themselves, not to learn to speak parts of a foreign language. However, there are certain terms that derive from the origins of Ju Jitsu, the training place is still known as a Dojo, the teacher of the class is known as sensei, and the traditional bow at the start and finish of lessons is referred to as a rei (pronounced "ray"). There is a lot of throwing in Ju Jitsu, but you will not start getting thrown until you have practiced Breakfalls and are competent our opinion. Most students start training this way, we will introduce you to a training partner, of a similar grade (or if you are lucky, one of the Black Belts may take you under their wing), You will then train with your partner throughout the rest of the session. Lessons are currently £ 10.00 per lesson for adults and £ 5.00 per lesson for juniors. There is a concessionary adult training fee for students, the disabled and the unemployed at £8.00 per lesson, and Juniors training at the adult club also receive a concession £8.00 per lesson. In addition to this there is the Association Membership Fee (includes Insurance) around £30.00 per annum. Other costs you are likely to incur are a Gi (training uniform) this will cost between £20.00 and £30.00 (available from your Sensei). 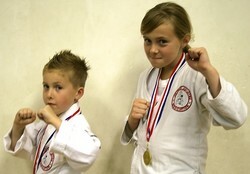 Gradings (average 2 per year) are £25.00 for seniors and £15.00 for juniors, including a new belt. Yes, if you know someone who is interested in Ju Jitsu, why not buy them a Gift Certificate allowing 3 lessons at Hando Ju Jitsu Clubs for just £16.00 for an adult, £12.00 for a teenager or £8.00 for a Junior. Because Jikishin Ju Jitsu is widely practiced, there are clubs training on every day of the week, so you can tailor your training regime to suit yourself. As long as you come along to the club to which you belong, once per week, you may train (with the permission of your instructor) at any other Jikishin Club you wish. Students should to train regularly, as it will improve the skill sets quickly, and allows the sensei to follow each individual’s progress. How often you train is optional. Beginners usually train once a week, with those who are studying and practising for the Black Belt 3 times a week is normal. Like any other skill, Ju Jitsu requires practice, to learn, to progress and to keep the skills sharp. In short, like anything else in life, the more effort you put in, the quicker you'll progress. What are the minimum and maximum that you take students? Yes, most likely, Ju Jitsu is excellent for women, as well as for men. 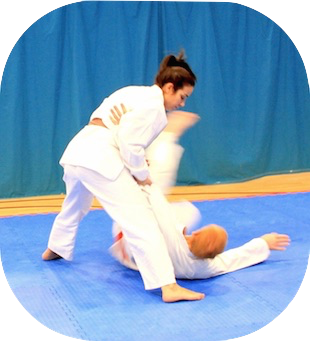 Many women choose to join a Ju Jitsu class because of the exercise, others because they wish to learn self-defence. The atmosphere at most clubs is extremely welcoming to women, and we have a large number of female Dan Grades within the Association. There are women training in the majority of our clubs. We also have clubs which are designated women only. 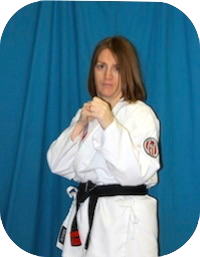 Hando have a number of female Black Belt Instructors including Jackie Walker - 4th Dan and Senior Instructor and many female students. This is up to you - for most students the simple answer is yes it certainly will. However, each individual is different, and training and learning to defend yourself is a great way to improve your self confidence. You will feel that you are in control and can face most situations. Self confidence is based on your own "view" of yourself, so if you feel confident when training, this will have a natural spill over into your normal life. Competitions are organised under various categories, and competitors enter according to weight, grade or in open categories depending on the discipline. It is apparent that there are very few obstacles to those who wish to compete. Have entered the competition within the time limit prior to competition. Yes, all students have to join the Jikishin Ju Jitsu Association, and this confers membership of the United Kingdom Martial Arts (GB) (although there is no individual membership of the UKMA (GB), membership is through the Associations only). There is an annual fee which includes all fees paid to the UKMAGB, Insurance, and Club and Association Membership are also included. There is a limited Insurance Scheme which is also provided - See Terms and Conditions on Insurance Certificate. There is a form to fill in and once the initial membership fee is paid, the membership process is complete. The Jikishin Ju Jitsu Association reserves the right to decline membership without giving a reason. How Long Has Jikishin Ju Jitsu Been In Existence? Jikishin Ju Jitsu Association was started by Professor Terry Parker - 10th Dan, in 1991. Hanshi Brian Herbert 8th Dan took over the management and responsibility of the Association, when Professor Parker retired in 2004. How Long have Hando Jikishin Ju Jitsu Clubs been in existence? Harlow & Ongar (HANDO) Ju Jitsu Clubs have been in existence since 1979, and Earl Walker has been the Chief Instructor since 1992. The club has a long history and has had a number of Instructors over the years. The club was first started by Professor Terry Parker, and Sensei Steve Fryer was the incumbent before Earl Walker. What is the difference between Ju Jitsu & Jiu Jitsu? There is no difference. Ju Jitsu or Jiu Jitsu are transliterations of the Japanese words/phrase which are not directly translatable into English as there are no English letter equivalents to the Japanese characters. This means that the words are translated phonically, and this gives rise to the difference in spellings. What is Brazilian Ju Jitsu? Brazilian Ju Jitsu is a sport inspired version of Ju Jitsu, modified from traditional Ju Jitsu by the Gracie family of Brazil, and now taught as both a standalone sport, or as part of a suite of skills utilised by MMA fighters. It is predominately ground based, and grappling with an opponent to a conclusion of either a submission or "choke out" where the opponent is rendered unconscious. What Qualification do your Coaches / Instructors hold? All of our Coaches have DBS (formerly CRB) Clearance, have completed the UKMAGB Coaching Course, have a current First Aid Qualification, possess Public Liability Insurance to a minimum of £5,000,000.00, and must abide by the Club Code of Conduct. Does the club have a Code of Conduct? The club has a Code of Conduct that covers all participants, parents and coaches. The Code of Conduct lays out the roles of responsibilities of all of those involved in the Club. A sheet giving the costs of training and the code of conduct is given to every new student, or in the case of Juniors, the parent who completes the Membership Form. Hando Ju Jitsu Club is an Unincorporated Association, and a not for profit organisation. A copy of the Club Constitution is available on request. Visitors to this Website who follow Links or Advertisements to other Websites, do so entirely at their own risk. Hando Ju Jitsu Clubs have carefully checked all Primary Links to this site, and maintains a policy of ensuring that all content is suitable and safe for visitors of all ages. Approval of a secondary Website, or independently produced Web Pages, is subject to a rigorous checking procedure to ensure that Linked content is safe. Beyond these Primary and Secondary Links, the Hando Ju Jitsu Clubs take no responsibility for any Link or Advertisement which may lead to a Website which contains content of an unsuitable, adult or disturbing nature.